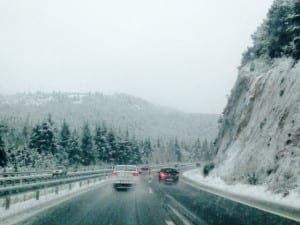 SNOW may be scarce on Spain’s south coast but preparing for the (moderately) big freeze is still essential for motorists. If your car is parked outside during the worst of the winter months, or you’re planning to visit the interior or venture north, there are some simple steps you can take to keep it road ready. Lights, heaters and wipers put high demands on the car battery and they have to work harder in colder weather. If your battery is over five years old it may be time to shop around for a replacement. Also, top up your windscreen wash with a more concentrated mix of antifreeze and give locks a quick spray with WD40. In the event of being stranded, make sure you have a phone charger as well as blankets, a folding shovel, jump leads, towbar and tow rope. If colder weather is forecast, make sure you have a full tank of fuel, as you may need to keep the engine running to stay warm until help arrives. Driving conditions can become challenging, so change to winter tyres to help with stopping.